THE story of day three on Ras 2017 was line-outs, and then more line-outs. It was one of the ‘easy’ days that don’t actually exist in the Rás. A flat day that was initially viewed as a transition day, before the road goes up in Donegal, it turned out to be super fast and super tough, producing a super Irish winner in An Post Chain Reaction’s Matt Teggart. There was bad luck from the off for John Quinn, flatting early when the bunch was starting to travel, and not much luck for Ronan Killeen either, who was under pressure before he started with some overnight sickness – kudos to him for taking to the start line and getting to Donegal, hopefully on the mend. Cross winds after the first climb combined with an outrageous pace left the race in tatters. James put in a strong ride and, after one line-out too many, got in a group that rode it back to Bundoran. Tomorrow the race finds itself in Donegal and the flat roads end. A series of climbs punctuates the day with the mighty Mamore Gap arriving with just over 10km left to race – a climb familiar to a lot of the club! 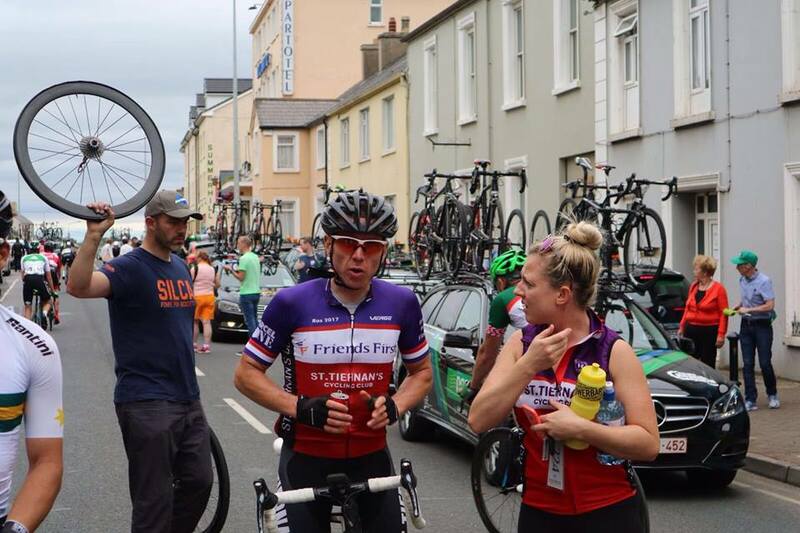 Shoutout to Kieran Regan’s Dad who got some shots of the team at the finish in Bundoran. No Replies to "Ras 2017: Stage Three - Redefining 'easy' as flat roads run out"